This Spring I presented at an event called The Meaningful Work Retreat. One of the co-presenters, Brenna Atnikov was working with a cool Calgary group called Thrive. It was the perfect example of becoming a hub that I talk about so much. It’s in the non-profit context but I thought you might be inspired by the example. Other lessons from this have to do with the power of being about something bigger (and how that can attract people who are also into those causes). A notion: sometimes we start with the niche/target market – yang. and other times we start with really honing and developing what we’re offering – clarifying our point of view and what we’re about – YIN. the yin path has us develop and then ask, ‘who out there would love this?’ and find our target markets from THAT. And then proceed to be delighted when those don’t work but some other group mysteriously shows up and loves it unexpectedly. If you become about a bigger cause – watch support come out of the woodwork. The thing that caught me were the networking events that they hold. As you read this, ask yourself, what are you about as a business? What’s the bigger cause? Could you bring people together around it? Remember: word of mouth spreads within a community. The tighter a community is – the faster word of mouth spreads. Everyone wins. Including you. And if you’re seen as a host to the network – you definitely win by gaining stature in your community. And there’s a difference to be held up here between building an empire and building a village. If you want to build your organization or business to be an empire, that takes a lot of work and control. But to support a network and community in thriving? Less so. You just need to ask yourself which one you want. Brenna gives us four important distinctions about networks vs. organizations below. I want to live in a city that has a strong, vibrant economy thats good for people and planet. Thrive works towards this goal by asking: What is the economy for and how can it create meaningful economic opportunities for people living on low-incomes? How are we all better off when nobody lives in poverty? Thrive is a collaborative network, which began in 2006. It cultivates an environment in which transformation of our economy can occur because we bring together folks who often don’t get to meet but who all play an important role in economic development strategies: local business, government and non-profit organizations. We provide a space for people to connect, learn, dream and act to create a resilient economy that combines social goals with business outcomes. Can you tell me more about the events YOU host and who’s invited? Thrive hosts between 4 and 6 events a year. Starting this year (2011) they closely correlate to our 4 strategic directions/pathways/strategic directions which guide our work. We host learning events, facilitate conversations and advocate for more helpful public policy along all four paths. 4. Innovative Social Finance – Stimulating conversation about how we can use local capital to invest in local economic development strategies. Being that we think of ourselves as a ‘learning network’ that aims to catalyze action through information, we host events that introduce people to new and/or promising practices in the broad world of community economic development that they can then apply to their own work. We might bring in a guest speaker, and then provide a local example of where CED is happening in Calgary. Or, we put an ‘ask’ out to the community to see who can take the lead on moving an initiative forward. Many of our events have been a kind of ‘lunch and learn’ style, averaging about 80 people per event. Our audience is the public, private and non-profit sectors and individuals interested in transforming the economy to better work for people and planet. Tell me about the difference between operating as an organization vs. a network? 1. Everyone is welcome to participate in a network. In an organization, you have to be hired. 2. People can contribute what they can, when they can, even if it’s only 1 idea EVER (in a network). In an organization, your job is to show up every day and contribute. 3. Networks facilitate two way communication with their community; most organizations simply ‘push’ information out. 4. Networks tend to be more emergent and adaptable, whereas organizations can be rigid. And why do these events when there are no immediate tangible benefits? We host our events because there are both immediate and long term benefits. Most immediately, people are building strong, working relationships across sectors that don’t typically interact with one another. Exposure to new thinking, promising ideas and exciting possibilities are the ingredients of inspiration that eventually move innovative projects forward. Over the long-term, these events are important because of their ability to bring people together and illuminate just what is possible in Calgary. As you’ll see below, tangible projects, initiatives and organizations also spring up. What are the participants saying about them? What results are you noticing coming from them? Overall, we get very positive feedback from guests at our events. Our satisfaction with events is often well above 95%. People often say that they were exposed to new ideas, met interesting people, tapped into a network of resources they didn’t know existed, etc. 1. The launch of Enterprising Non-Profits Alberta came into being because of a variety of different players. We feel that Thrive played a role by: (1) hosting several events in 2006 and 2007 around social enterprise, which led to 3 funders being interested in the concept. The funders commissioned a study, and (2) the final report was presented at a Thrive event in 2009. One funder (The Calgary Foundation) was particularly interested in following this further, and Enterprising Non-Profits Alberta was launched in February 2011. It is now funded by The Trico Charitable Foundation. We have begun to co-host several events with them now and they are an important partner. 2. 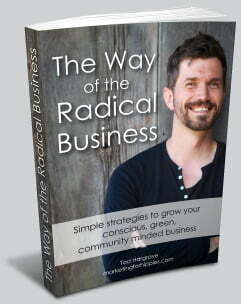 In February 2011, Thrive, Conscious Brands and Green Calgary brought Woody Tasch to Calgary. He is the founder of Slow Money. We just recently received an email from one of the guests at that event, telling us that (in part )as a result of the Slow Money event and getting to meet Woody Tasch, some folks from Leduc have started Slow Money Alberta. This is incredibly exciting for us to hear! In summary, we are catalyzing action and inspiring different groups/people to take a necessaryleadership role on a specific area of interest, while Thrive can continue to be the incubator space for new ideas and possibilities. What are the downsides of hosting a network? Hmmm, honestly, I cannot think of any. We’ve had nothing but great experiences and involvement with the community since we formally launched this governance structure in February. 2. Collaboration (vs. competition) is way more fun, productive and stimulates innovation. 3. When nobody lives in poverty, we are all better off. We are all responsible for ending poverty. Can you give a few examples of the first lesson? The ‘things’ we’ve named and put out in the world as what we care about are our 4 pathways. Since naming them, we’ve had people approach us with opportunities because they now know where our time/energy/resources are focused. For example, we were invited to co-hosted Community Capital Networks with REAP and are part of some initial conversations about how to mobilize local capital for our community.